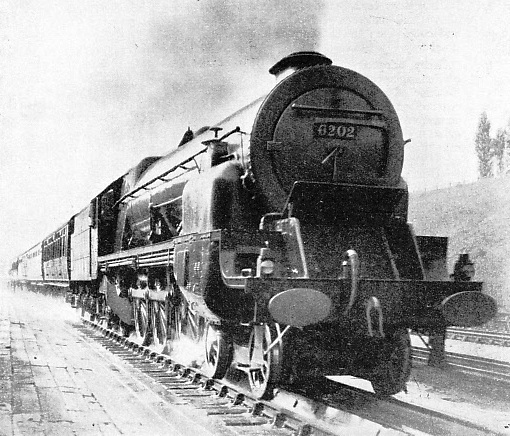 A BRITISH TURBINE-DRIVEN LOCOMOTIVE at the head of an express passenger train. No. 6202, of the London, Midland and Scottish Railway, is a non-condensing turbine locomotive built in 1935. This engine, which has the 4-6-2 or Pacific wheel arrangement, is equipped with a 2,000 horse-power main turbine on the near side for forward running and with a smaller turbine on the off side for reverse running. No. 6202 is one of the most successful turbine locomotives ever built. THE steam turbine is familiar enough in the field of marine engineering, but until recent years it has suffered almost complete neglect where land transport, as in railways, is concerned. This may be thought strange, when we realize that the principle of the turbine - a circular motion caused by a powerful jet or current - is older than our mechanized civilization, and certainly much older than anything resembling an ordinary reciprocating engine. The advantages of the turbine as against the reciprocating engine are as concrete in railway practice as they are elsewhere. Its disadvantages are of a kind that may well be eliminated with the progress of experiment. Exactly the same thing happened in the early days of the reciprocating locomotive. Stephenson’s Rocket of 1829 was a faster, more efficient, less clumsy and much lighter engine than Hedley’s Puffing Billy of 1813. A similar comparison may be made between a modern light motor car and one of, say, 1907. The reciprocating engine, with its back-and-forth motion converted to a circular motion through connecting rods and cranks, can never be as perfectly balanced a machine as a purely rotary engine such as the turbine. With balanced crank axles and valves set to a nicety, however, the heavy reciprocating masses of an ordinary engine may be made to run fairly smoothly. One of the drawbacks of a reciprocating engine is that, because of the use of cranks and the constantly varying pressure in the cylinders, there arises what is known as an uneven turning moment. In a locomotive this gives a fluctuating drawbar pull which in some engines may be so marked as to be transmitted to the coaches behind the engine. The movement, a frequent cause of travel sickness, was particularly noticeable with some of the compound locomotives built by Francis W. Webb for the old London and North Western Railway in the latter part of the last century. With the steam turbine, the impulse is constant and perfectly even, so that the turning moment also is even. It rivals the electric motor in this way, and is technically superior to the ordinary steam engine and even to the high-speed internal combustion engine. Aeronautical engineers have already experimented with the application to aircraft of a lightweight steam turbine, supplied by a featherweight “flash” generator. There are, however, certain disadvantages in the turbine as applied to a railway locomotive. Among them is the matter of transmission. The steam cylinder, through its piston and connecting rod, acts directly on the driving axle of the engine. The turbine cannot be coupled up to the driving axle directly, because it must run at a high speed to be efficient. Some form of transmission system must intervene, providing an additional complication not found in the reciprocating locomotive. In this way the steam turbine suffers from the same disabilities as the high-speed internal combustion motor, though the internal combustion motor is further handicapped for rail traction by starting difficulties. Electrical transmission, involving a generator driven by the turbine, and supplying current to electric traction motors, is expensive and cumbersome. As for mechanical transmission, we already know what a long and chequered history this has had in the ordinary road motor car. The turbine may need a condenser to produce a vacuum for its exhaust. This is another cumbersome feature which, in a loco-motive, has to be carried in company with the rest of the machine. Yet, as we shall see, the designers of turbine locomotives in modern times have been slowly but surely making their products more and more simple. “ELECTRO-TURBO-LOCO” built by Reid and Ramsay in 1909-10. An ordinary locomotive boiler supplied steam to a turbine, which was coupled to a generator supplying current to motors mounted on four of the locomotive’s eight axles. The engine was carried on two motor bogies, each of the 4-4-0 wheel arrangement. The cab, which ran the length of the turbine and generator, was in the middle. It is to the engineers of Great Britain, Switzerland, Germany and Sweden that modern engineering science owes the introduction of the steam turbine locomotive. A Scottish firm, the North British Locomotive Company of Glasgow, one of the largest builders of locomotives in the world, sponsored the first steam turbine locomotive with electrical transmission. Reid and Ramsay, the designers, were trying to produce an electric locomotive which would be independent of power stations, contact wires and conductor rails. The designers adopted a steam turbine as the most suitable mechanism for driving their generator. As might have been expected with a first attempt, the machine, built in 1909-10, was complicated and, to our eyes, clumsy. An ordinary locomotive boiler at the back with its chimney facing, “aft”, supplied steam to a turbine, which in its turn was coupled to a generator supplying current to motors mounted on four of the locomotive’s eight axles. Somewhat in the same way as a Fairlie articulated locomotive, the experimental engine was carried on two motor bogies, each with the 4-4-0 wheel arrangement. The cab, which ran the length of the turbine and generator, was in the middle. This was not the first time that railway engineers had attempted to build an electric locomotive which was its own power house, for Heilmann had produced such a machine early in the eighteen-nineties. It ran experimentally on the Western Railway of France, now incorporated in the French State Railways. The Heilmann locomotive, however, incorporated an ordinary reciprocating engine, and it was left for Reid and Ramsay to apply the turbine. The Reid-Ramsay “Electro-Turbo-Loco”, as it was called, ran a number of trips, and at least proved that turbine propulsion with electrical transmission was possible. There was little chance of peaceful experiment during the war of 1914-1918, but in the beginning of the nineteen-twenties, both Reid and Ramsay again entered the field of turbine locomotive experiment, though this time they worked separately. In collaboration with Macleod, Reid produced a new locomotive in which the electrical transmission system was eliminated, and the turbines were geared directly to the driving axles. THIS REID-MACLEOD LOCOMOTIVE, exhibited at the British Empire Exhibition, Wembley (Middlesex) in 1924, had many features recalling the Reid-Ramsay engine of 1909, illustrated above. The driver’s cab was in the middle; behind it was the condenser. The two motor bogies were arranged so that they had the wheel arrangement 4-4-0 + 0-4-4. The turbines were directly coupled to the motor bogies by spur gearing. Certain features of this Reid-Macleod locomotive, which was built by the North British Locomotive Company and exhibited at the British Empire Exhibition at Wembley (Middlesex) in 1924, were strongly reminiscent of the Reid-Ramsay locomotive. The boiler was similar, but was placed at the front. The two motor bogies were outwardly similar, but were differently arranged, the driving wheels being at the inner end of each, making the wheel arrangement 4-4-0 + 0-4-4 instead of 4-4-0 + 4-4-0. To these the turbines were directly coupled through spur gearing. The driver’s cab was in the middle, and behind it came a large condenser, enabling the locomotive to use the same water over and over again. Forced draught by fans took the place of the usual draught formed by the exhaust, as this exhaust was, necessarily, wanting. This process of condensing the exhaust into fresh feed-water increased the locomotive’s thermal efficiency, and also lengthened the potential life of the boiler. The boiler thus used condenser-water at all times except immediately on starting. The water was distilled as soon as it had once been used, and the formation of deposit on the insides of the boiler plates, that old bugbear of all ordinary steam boilers, was almost entirely eliminated. On the other hand, the condenser was a heavy and cumber-some piece of mechanism, though in the Reid-MacLeod locomotive it certainly increased the adhesion weight of the after motor bogie. Meanwhile, the fertile brain of Ramsay had not remained idle. He remained faithful to the turbine electric locomotive. The second Ramsay locomotive appeared at approximately the same time as the Reid-Macleod turbine engine, for it was built by Sir W. G. Armstrong, Whitworth and Company at Scotswood-on-Tyne in 1921. As with many purely electric locomotives, this was a double-unit machine with two sets of coupled wheels, each set being under a separate vehicle. The wheel arrangement was 2-6-0 + 0-6-2. Each vehicle contained a main and an auxiliary turbo-generator. The main generator in either instance, with the turbine running at a speed of 3,600 revolutions a minute, developed 890 kW at a pressure of 600 volts, and supplied two traction motors, the whole double unit having four motors in all. 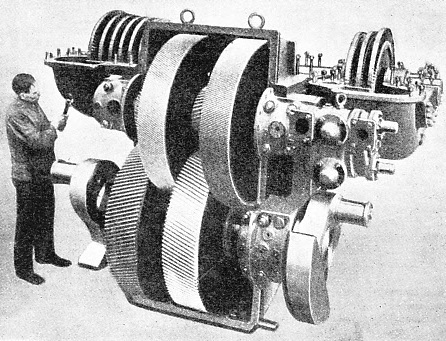 These motors were connected with the coupled wheels through gears and jack-shafts, as in many large electric locomotives on the Continent and in America. At a motor speed of 1,175 revolutions a minute, the locomotive was capable of sustaining a maximum speed of sixty miles an hour with a train of coaches. The leading vehicle of the Ramsay engine carried an ordinary locomotive-type boiler, which, in the absence of the usual exhaust in the smokebox, was supplied with forced draught from electric fans drawing their energy from the auxiliary turbo-generators. The working pressure was 200 lb per sq in, which is a common figure for the boilers of ordinary reciprocating locomotives. Behind the boiler came the driver’s cab, with the coal bunker adjacent to it on the front of the second vehicle. Most of the second vehicle was taken up by the condenser. Ramsay adopted an ingenious principle in his design of the condenser. From the turbine exhaust he led the used steam into a header, whence it passed into a nest of small tubes. The header took the form of an exhaust steam drum rotating in bearings and with the condenser tubes radiating from it. The lowermost tubes were immersed in a well of water, the level of which was kept constant by a pneumatic float valve. with the exhaust of a locomotive of this size it had to be a large and ponderous arrangement. Some idea of this will be gathered from the fact that the second (condenser) vehicle weighed 63 tons 10 cwt, only 3 tons 15 cwt less than the front vehicle carrying the boiler. The total weight of the whole locomotive unit was 130 tons 15 cwt, a high figure for an engine developing a normal power output of only 1,100 horsepower, or 1,440 horse-power at one hour’s rating. An orthodox four-coupled reciprocating locomotive of about the same weight, built for the Bavarian State Railways in 1906, exerted 2,000 horse-power. On the other hand, the Bavarian engine was designed on principles which had years of development behind them, whereas only one Ramsay locomotive had been built before. The Ramsay locomotive underwent extensive tests on the Lancashire and Yorkshire lines of what is now the London, Midland and Scottish Railway, and at least proved itself capable of performing the duties its designer claimed for it, putting up a reliable performance on the Southport trains. It was, however, too large and complicated to be duplicated. The purely turbine driven locomotive, that is, the type with direct drive and no electrical transmission, is exemplified in exper-iments carried out in various countries, primarily on the European continent, and latterly in Great Britain. At the beginning of the nineteen-twenties Herr Zoelly, in conjunction with the engineers of the Swiss Locomotive Works at Winterthur, began the first of a long and remarkable series of experiments with steam turbine locomotives. An ordinary standard type 4-6-0 locomotive of the Swiss Federal Railways was taken out of service and stripped of its cylinders and motion, and the boiler was pitched a little higher than usual to give clearance for the new driving mechanism. On this locomotive Zoelly placed a turbine designed to run at a speed of 8,000 revolutions a minute, the power being transmitted through gears and a jackshaft to the leading coupled axle. The engine preserved the 4-6-0 wheel arrangement after its con-version, the turbine being mounted over the bogie. In this example, Zoelly arranged for reversal by gears. It was a condensing engine, forced draught being provided by fans. He placed his condenser under the boiler barrel, and from it led the condensate into a roof over the tender, whence it was allowed to fall in narrow streams to the tank underneath. Switzerland, however, a country with an avowed national policy of railway electrification and almost unlimited water power, offered little future for the steam locomotive, whether turbine or reciprocating. Zoelly transferred the field of his experiments to Germany, a nation that has always been in the forefront where mechanical engineering is concerned. 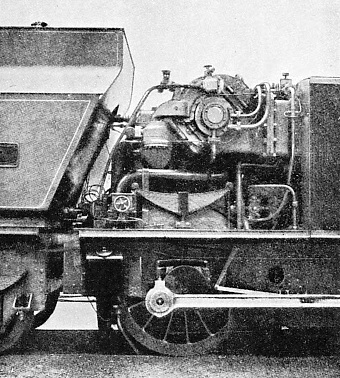 The engineering firm of Krupp undertook to build a new and larger Zoelly turbine locomotive in its works at Essen, and this duly appeared in 1924. BUILT AT ESSEN FOR THE GERMAN STATE RAILWAY, this 4-6-2 locomotive has turbines of the Zoelly type. The main turbines and the transmission gearing are placed at the leading end below the smokebox. There is a separate turbine for reverse working, the gearing being between the two turbines. The condenser is placed behind the turbines and between the boiler and the frame. The driving wheels are of 5 ft 5-in diameter. The boiler supplies steam at a pressure of 225 lb per square inch. It was a Pacific or 4-6-2 type engine, and differed from its predecessor in several important particulars. As in the Swiss machine, Zoelly mounted his turbine motion in front of the smokebox, with the leading bogie for support. The turbine equipment was built in Switzerland and handed over to Krupp’s for incorporation in the locomotive. In contrast to the Swiss engine, however, that built by Krupp’s had two turbines, one for forward and one for backward motion, thus eliminating the complications of reversing gears. The forward turbine, with an output of approximately 2,000 horse-power, was placed on the right-hand side of the locomotive, with the backward turbine balancing it on the left hand. Power transmission was effected through spur-wheels mounted on the turbine shafts, thence through gearing to an intermediate transmission shaft, then by further gears to a jack-shaft mounted above and between the bogie axles and coupled up to the side rods in the usual way. Zoelly adopted the same form of condensing apparatus as on the previous machine. The condenser proper was in two sections, one behind the other, and connected by telescopic pipes. The exhaust steam passed from the turbine into the leading condenser, there to be cooled by cold water drawn from the tender. Any steam remaining uncondensed then went on through the telescopic pipes into the second condenser, the condensate finally being sprayed and returned to the boiler to be used again. REAR VIEW OF TURBINE AND GEARING of the German locomotive illustrated above. The turbines were manufactured at Zurich, Switzerland, but the rest of the engine, including the gearing, was built in Germany. The gearing is of the single-helical type with hardened teeth. The turbines have an output of 2,000 horse-power at 6,800 revolutions a minute. Zoelly placed a number of small auxiliary turbines on the locomotive, one of them being designed to return the condensed water to the boiler. He placed another in the tender, to drive a fan directing cooling air on to the streams of water coming from the condensers. A third turbine operated a fan, this time to provide draught in the smokebox in the absence of the usual exhaust. For a steam generator Zoelly used an ordinary loco-motive-type boiler with two domes, one performing the normal function of collecting the steam for delivery to the engine itself, and the other containing a water-softener. A Schmidt superheater was fitted with a smokebox preheater for the feedwater passing to the boiler. Some remarkable results were obtained on the trials of the Krupp-Zoelly turbine locomotive over the lines of the German State Railway, and since then several further turbine locomotives of successively greater power and improved design have been built for work on the German lines. Germany has, however, not yet adopted any one design for general service. It is to the Swedish engineer Ljungstrom that the transport world is indebted for the latest and most varied developments of the steam turbine railway locomotive. His experiments have taken place over a number of years. Sweden, being a country deficient in coal, is particularly interested in an increase in the thermal efficiency of the locomotive and in fuel economies. IN USE ON THE GERMAN STATE RAILWAY, this Pacific condensing turbine locomotive was built by J. A. Maffei of Munich. It is based on the pioneering work of Herr Zoelly, who began experimenting during the nineteen-twenties in Switzerland. The first German turbine locomotive built to the designs of Herr Zoelly appeared in 1924. The turbine motion was mounted in front of the smokebox, and was supported by the leading bogie. These were separate turbines for forward and for reverse motion. on the condenser carriage, the boiler having a vehicle to itself. The boiler thus became, in effect, a kind of tender, and the vehicle which in normal practice is known as the tender became the engine. This gave the designer more room for his turbines. At the same time the great weight of the condenser and tanks furnished the essential factor of adhesion which is provided, in an ordinary locomotive, by the boiler. Ljungstrom’s first practical attempts were made at the beginning of the nineteen-twenties, and took the form of a series of trials with a large locomotive on the Stockholm-Gothenburg line of the Swedish State Railways. The line in question, now electrically operated, was then an ordinary steam railway. The turbomotive - this new word has already passed into at least semi-official usage - was certainly a marvel as far as fuel economy was concerned. Compared with the ordinary 4-6-0 and 4-4-2 reciprocating locomotives then in use on the Stockholm-Gothenburg line, it showed a saving in fuel of no less than 50 per cent. The condenser saved 90 per cent in water, the little that was used on the journey of 294½ miles being drawn off from the tanks merely to compensate for losses by leakage and steam being blown off through the safety-valves. The work of this engine attracted a great deal of attention throughout the engineering world, and in England, the firm of Beyer, Peacock and Company undertook to build and test a similar engine with a view to demonstrating the merits of the turbine to British locomotive men. LJUNGSTROM TURBINE LOCOMOTIVE, built in 1924-26 by Beyer Peacock & Co, Ltd, at Gorton Foundry, Manchester. The boiler carriage was mounted on ten wheels, six fixed and the remaining four mounted on a leading bogie. The side tanks held 600 gallons of water and the condenser tank 1,350 gallons. Behind the footplate was the coal bunker, holding 6 tons of coal. The total weight of the engine was 143 tons 14 cwt and the tractive effort 38,000 lb. This engine will serve as a typical example of a Ljungstrom condensing turbine locomotive. Designed strictly on the lines laid down by Ljungstrom, it was built at Gorton, near Manchester, by Beyer, Peacock and Company, Limited, under the supervision of Robert H. Whitelegg, who had held the position of Chief Mechanical Engineer to the Glasgow and South Western Railway, now part of the LMS. Work was begun in 1924. In true Ljungstrom tradition, the boiler was isolated on its own carriage, the steam pipe between the two vehicles having a ball-and-socket joint to allow side-play in rounding curves. The condenser-and-turbine vehicle, forming the engine proper, had six coupled wheels of 5 ft 3-in diameter. The main turbine, driving these six coupled wheels, was of 2,000 horse-power, and worked at a pressure of 285 lb per sq in. This turbine could propel the locomotive forwards or backwards with equal facility, through the medium of gearing. At 10,000 revolutions a minute, the speed forwards or backwards was seventy miles an hour, the normal maximum being seventy-five miles an hour. The tractive effort of this locomotive was 38,000 lb, which challenged comparison with that of some of the largest reciprocating locomotives then at work in Great Britain. THE CONDENSER VEHICLE of the Beyer Peacock turbine engine illustrated above, with the cooling tubes not yet in place. This vehicle contained the turbine and condenser and formed the engine proper. It had six coupled wheels, of 5 ft 3-in diameter, and four smaller wheels, of 3 ft 3-in diameter. The main turbine, developing 2,000 horse-power, worked at a pressure of 285 lb per square inch. It could propel the locomotive either forwards or backwards, through the medium of gearing. This remarkable locomotive underwent its trials on the main Manchester (Central) to London (St. Pancras) line of the London, Midland and Scottish Railway, and put up some excellent performances on the regular express trains. The condenser of this engine was in a way reminiscent of a gigantic radiator, for it consisted of batteries of ribbed and flattened copper tubes cooled by a blast of cold air projected by four large fans. A fifth fan was mounted on the front of the smokebox to provide a blast; and inside the smokebox was a preheater, for the air passed down to provide forced draught in the furnace itself. T he boiler carriage was mounted on ten wheels, six fixed and the remaining four mounted on a leading bogie. On either side of the boiler was an ordinary side-tank, supplying water to the condenser through a pneumatic float valve; behind the boiler was the cab, and behind that the coal bunker. The boiler carriage thus resembled a large tank locomotive without any driving mechanism. The weight of the boiler carriage was 69 tons 16 cwt, and that of the turbine and condenser carriage 73 tons 18 cwt, the whole double unit thus weighing 143 tons 14 cwt. NEAR SIDE OF LEADING END of the condenser vehicle belonging to the locomotive illustrated above. The condenser vehicle weighed 73 tons 18 cwt, of which 54 tons 12 cwt, taken by the coupled wheels, were available for adhesion. The condenser consisted of batteries of ribbed and flattened copper tubes cooled by a blast of cold air projected by four large fans. In his latest designs, Ljungstrom has made a complete change. The condenser has vanished, the boiler is mounted on the same vehicle as the turbine, and the engine has an ordinary tender attached. The Swedish Grangesberg-Oxelosund Railway was willing to give the Ljungstrom non-condensing turbomotive a trial. Something powerful, yet economical, was needed for the haulage of the great iron trains down to the Baltic port of Oxelosund, near Nykoping. The trial locomotive appeared in 1933. It is a 2-8-0, and some idea of its capabilities as an economizer in fuel are at once obvious when it is seen that a small four-wheeled tender is sufficient to supply all its wants. The resemblance to an ordinary locomotive is remarkable. An illustration and brief account of this locomotive appear on page 186. The net result of this locomotive’s trials has been interesting. Instead of having recourse to electrification, the Grangesberg-Oxelosund Railway has adopted the non-condensing turbo-motive for working its heavy mineral trains from Central Sweden to Oxelosund, and two more have been put into service. This is the first time in locomotive history that turbine propulsion has been officially adopted by any railway company. T he successful trials on the Grangesberg-Oxelosund Railway attracted attention in quarters far removed from Sweden. Mr. W. A. Stanier, Chief Mechanical Engineer of the London, Midland and Scottish Railway, decided to give the non-condensing turbomotive a fair trial. He produced his experimental engine in the summer of 1935, since when it has been undergoing exhaustive trials on the LMS. Structurally, it is an adaptation of the same engineer’s standard 4-6-2 express engines of the Princess Royal class, with an ordinary tapered boiler, at first domeless. In 1937 the boiler was provided with a dome. The smokebox is fitted with a double chimney. LMS TURBINE LOCOMOTIVE taking water at Bushey (Herts) troughs. No. 6202 weighs 163 tons 13 cwt, including its six-wheeled tender. Steam, at a pressure of 250 lb per sq in and having a temperature of about 750° Fahrenheit, is admitted progressively to the nozzles bearing on the turbine blades, so that the revolution speed of the turbine blades rises to its maximum at an even rate. Mr. Stanier placed a 2,000 horsepower main turbine on the near side of the frames, the turbine fitting being carried out at Trafford Park, Manchester, after the main frames h&d been completed at Crewe Works. This turbine is for forward running, a smaller turbine being mounted on the other side for reverse working. As the engine is intended for express passenger traffic, on which it invariably runs chimney foremost, a turbine of full capacity is not needed for travelling in the reverse direction. The steam, at a pressure of 250 lb per sq in and a temperature of about 750° Fahrenheit, is admitted progressively to the nozzles bearing on the turbine blades, so that the revolution speed of the turbine blades rises to its maximum at an even rate. The LMS turbomotive - No. 6202 - weighs 163 tons 13 cwt, with its six-wheeled tender; the six coupled wheels are 6 ft 6-in in diameter, and the boiler has a total heating surface of 2,967 square feet, of which 653 square feet are provided by the super-heater. Since its completion, it has taken its turn with the ordinary type 4-6-2 locomotives of the LMS on the Royal Scot and other famous expresses. Among the many notable runs to the credit of No. 6202 are several with the up Liverpool “flyer”, which is booked to cover the 152.7 miles between Crewe (Cheshire) and Willesden Junction (London) in 142 minutes. On one occasion the turbomotive, hauling 331 tons tare (345 tons full), gained eleven minutes on this fast schedule, running the distance in 131 minutes at an average speed of 69.9 miles an hour. Two striking features were the minimum of 72 miles an hour at Tring summit (Herts), at the end of the fifteen-miles ascent from Bletchley, and a sustained maximum of 90 miles an hour on the reverse slope of the Chiltems. FITTED WITH A DOME in 1937, No. 6202 has slightly altered in appearance since it was built in 1935. The six coupled wheels are of 6 ft 6-in diameter. Total heating surface is 2,967 square feet, of which 653 square feet are provided by the superheater. The locomotive has many noteworthy runs to its credit. On one occasion, hauling 345 tons full, it took the up Liverpool “flyer” from Crewe (Cheshire) to Willesden Junction (London), 152.7 miles in 131 minutes, at an average speed of 69.9 miles an hour. You can read more on “Turbine-Driven Locomotive” on this website. You can read more on “A British Ljungstrom Turbine Locomotive” and “Experimental Locomotives” in Railway Wonders of the World.